Portfolio | 16 Acres Computers, Inc. 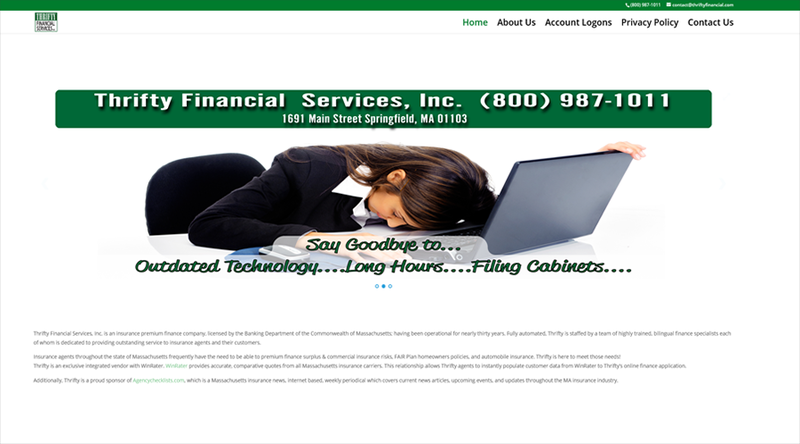 Advantage Staffing, a job staffing firm in West Springfield, Mass., had a website built on 10-year old technology. What they needed was a site that enabled candidates to easily search and apply for jobs. We worked with them to create a dynamic website featuring rotating jobs postings and one that is use on a tablet or cell phone. 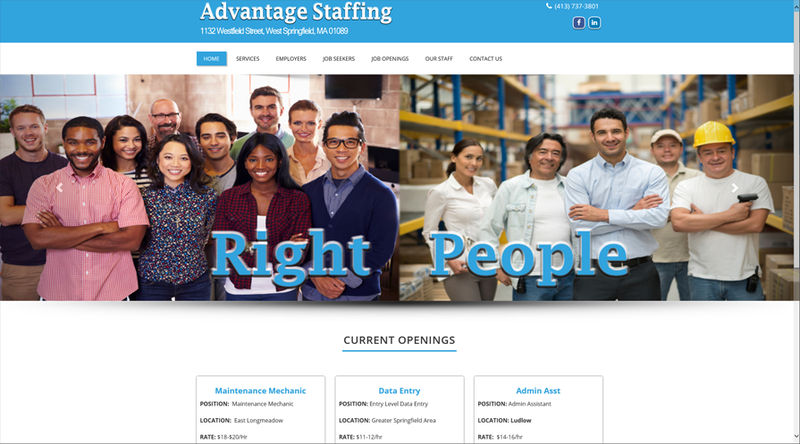 Now the folks at Advantage Staffing upload their job postings on a regular basis, and we assist by maintaining the site. With the new site and some search engine optimization (SEO) tweaks, they’ve seen a marked increase in job applicants to their site. 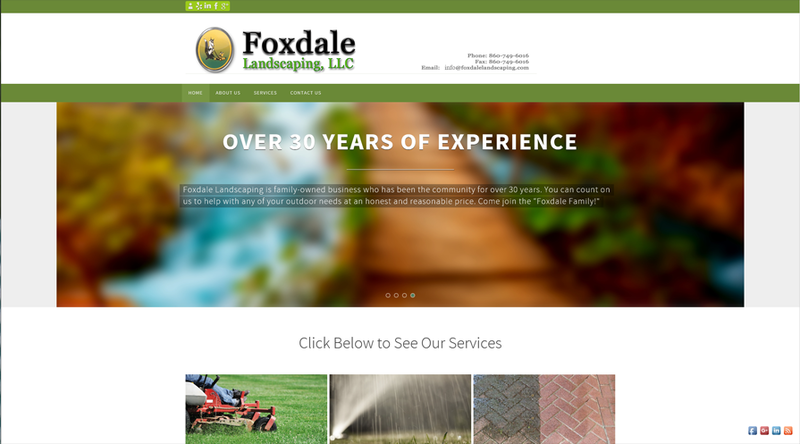 Foxdale Landscaping in Somers, Conn., lacked an online presence when we met. They asked us for a turnkey solution (meaning limited input on their part) and we delivered a vibrant and informational site. Shortly after the website went live, they received compliments on the “enjoyable new site” and reported, “We’re getting jobs including our biggest jobs yet!” As part of our website services, we host their site, enhance its search engine optimization, and make seasonal updates. 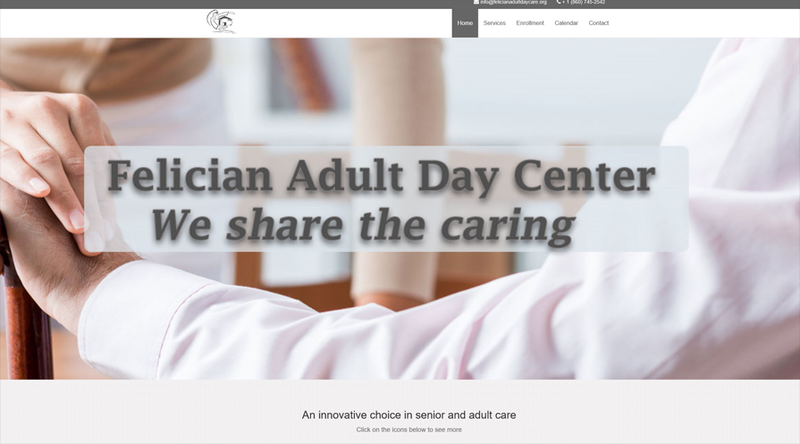 Felician Adult Day Center, located in Enfield, Conn., is a team of healthcare professionals who give cognitively impaired adults and their caregivers an innovative choice in health care. A generous staff person assembled an out-of-the-box website, but it required more customization and technical skills – so we asked if we could help. We started from scratch and created a new light and friendly site with the features they wanted: photo testimonials, a monthly activity calendar, and donation page. Thank you to the FADC for this opportunity and for doing so much for others. 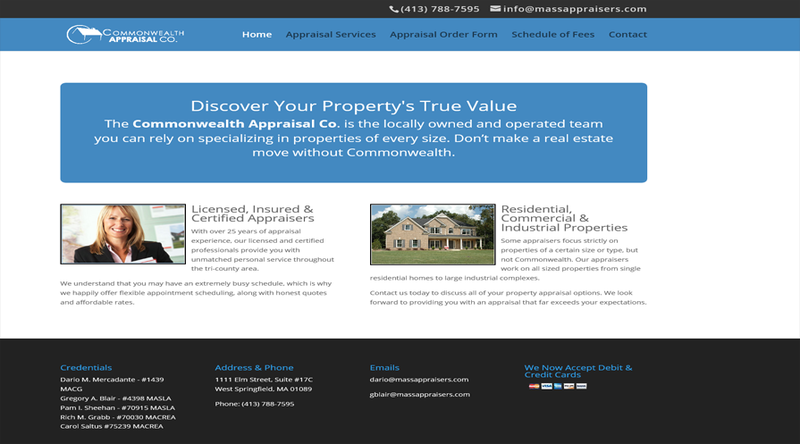 Commonwealth Appraisal Co. is a West Springfield, Mass.-based property appraisal company. Unfortunately, they used a third-party website service (HIBU), and when they cancelled their contract, they lost their website completely despite being assured it wouldn’t happen. We worked with their staff to create a dynamic, user and mobile-friendly website which we maintain and assist with whenever they need it. Thrifty Financial Services is an insurance premium finance company, located in Springfield, Mass., that has been in business for nearly thirty years! Their website was outdated and insecure, being flagged by search engines and security applications like McAfee and Norton as unsafe. We wiped the slate clean, built them a stable and mobile-friendly website and got them off the “do not visit” lists! Now they are enjoying their new streamlined site with the assurance that clients can safely visit their website. 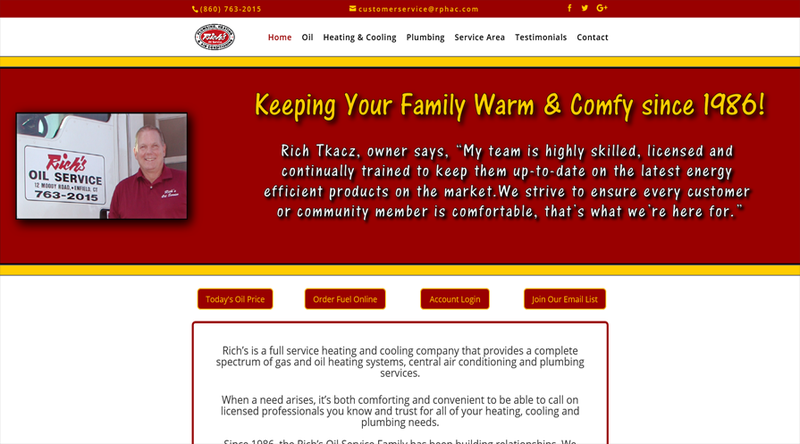 Rich’s Oil is a great company that provides a complete spectrum of gas and oil heating systems, central air conditioning, and plumbing services in Enfield, Conn. As with many of our customers, their website (designed in 2009) was slow and inefficient. We worked with Rich and his friendly staff to design a mobile-friendly site that provided advertising opportunities and an account portal to allow customers to log in. With the new site, search engine optimization and monitoring website traffic, we can help steer new business to Rich’s Oil. 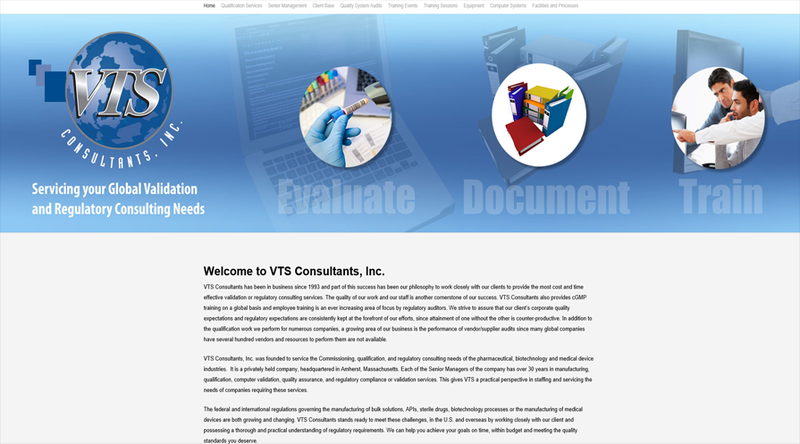 VTS Consultants, Inc., an engineering firm in Amherst, Mass., was in a rough spot when first met. Unfortunately, an unscrupulous web designer raised his annual fees without warning and removed their website, failing to provide backup pages. Piecing together a new website with only a few previous screen shots, we worked quickly and developed the mobile-friendly site they have been advertising their services ever since. An unhappy situation led to a long-standing working relationship which we hope to maintain for years to come.